We chose the name, A Trip Through Time, for our barn quilt. This name fits with our pattern, because in each corner there is a symbol that represents the evolution of our farm. The building the barn the quilt is hung on was built in the early 20th century. It is mortise and tenon constructed. The original function of the barn was for hay storage, and is the same today. 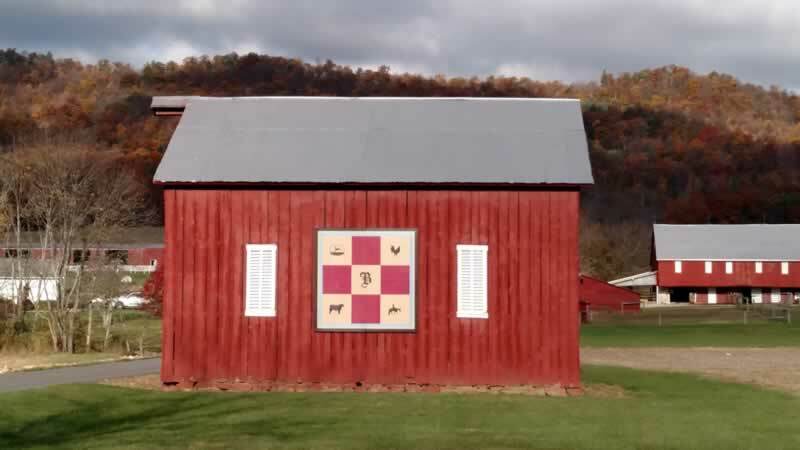 The major part that inspired our family the most, to hang a barn quilt at our farm was our family history. Our family has lived in Fulton County, PA for about 150 years. The property we live on has been in our family for around 130 years. Our farm is a century farm, along with our family being the 2nd owners from William Penn. William Penn owned our land first. It was then sold to John Bell, who was a famous potter. In 1884 Henry Barmont bought the farm, and has been in our family ever since.